If there is one area where the idea of trickle-down works it has to be in technology. In the beginning any new technology is always expensive but over time it begins the downward curve where it becomes more accessible to more people. Such is the case with the magic of face-swapping. Now I’m not talking about the Nicolas Cage movie or the medical procedure but rather the ability for digital film editors to swap faces, much like we saw in the movie The Social Network with the Winklevoss twins. Even there though the process is expensive and out of the range of low-budget movie makers but that could change thanks to the work of computer scientist Kevin Dale who has come up with a digital “face transplant” system that can be done with a desktop computer, simple lighting, and a single camera. Using his system it is a matter of getting footage of both a “source” actor and a “receiving” actor, who both can be talking by the way. 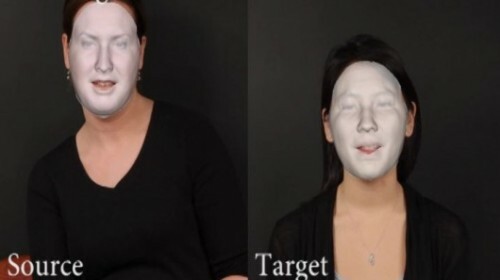 This footage is processed by some software that creates a 3D model of each face and then subtly alters the pose and speech of the target actor to match the source actor. Apparently using Dale’s system ten seconds of finished footage takes about 20 minutes to render with next to no input from the user.